General Electric will build Innovation Point, its' new headquarters facility, on an approximately 2.5-acre parcel located on Fort Point Channel in Boston's Fort Point neighborhood. The parcel consists of two historic six-story brick Boston Wharf Company warehouse buildings at 5 and 6 Necco Court and a section of the existing Gillette parking lot. Designed by Gensler, GE's approximately 2.5-acre, 390,000 square foot campus will restore the existing warehouses and construct a new 12-story, 293,000 square foot building. The three buildings will be connected by a bridge and a public pedestrian walkway, GE Plaza. Approximately 1.5 acres of public space will be constructed at Innovation Point, including a Harborwalk extension. The campus will also include a coffee bar and waterfront restaurant space on the ground floor. Innovation Point will house approximately 800 employees. The campus will also include a variety of community spaces including hands-on classroom workspace for local tech startups and students, convener space for community presentations and events, public co-working space, an "innovation and exploration center" highlighting the past, present, and future of GE and a life science company incubator space where GE will engage 6-12 early stage companies to develop "innovative co-created products." Innovation Point will be LEED Version 4 compliant and will include state-of-the-art environmentally-friendly and sustainable features such as a distinctive "solar veil" that will cover the new building's facade with solar panels. 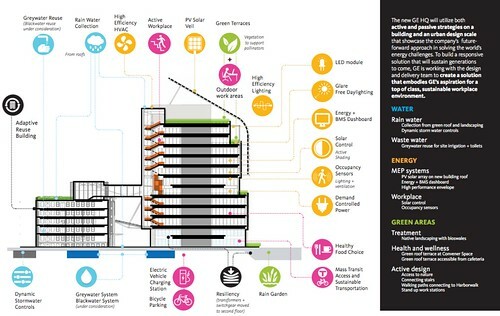 Other features will include green roof areas, dynamic stormwater controls, and high-efficiency HVAC and lighting. GE's campus will encourage the use of public transportation, walking, biking and other alternative methods of transport; a total of 30 car parking spaces will be constructed on site in an underground garage. 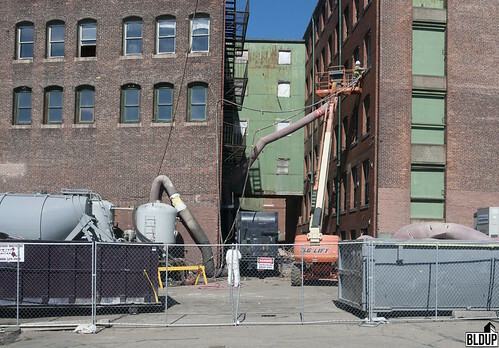 Renovations of two historic buildings in Fort Point continue as GE announces it will scrap plans for the second phase of the project, a new 12-story tower. Instead of the original 800 person campus, GE’s headquarters now will have about 250 employees in the two refurbished buildings. GE plans to lease the buildings, after selling them and the adjacent land for the tower jointly with the state to recoup the $25 million tax incentive received from the city. At the site currently, structural steel for the glass enclosure connecting the two buildings has been erected and window install is ongoing. The crane on site is supporting the erection of the structural steel for the roof and the new 6th floor on the west building. Rough-in of interior walls and interior masonry restoration is also underway in both buildings. Construction is set to be complete by the middle of this year. Renovations of two historic brick warehouse building at 5 & 6 Necco Court continue for GE's new Headquarters, Innovation Point. In addition to restoring the warehouse buildings, the project will include a new 12-story 293,000 square foot building and 1.5 acres of public space. All three buildings will be connected by a pedestrian walkway and the project will also extend Boston's Harborwalk. The first phase of the project, the renovations, are expected to be complete in the first half of 2019. 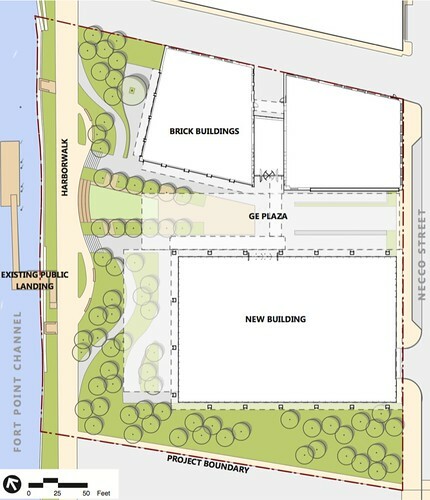 Completion of Phase Two, construction of the new building by Suffolk Construction and creation of new public open space along Fort Point Channel, is expected in mid-2021. Construction continues at GE’s future headquarters in Fort Point. The project is being completed in two phases, pushing full completion of the project to 2021. Renovation of the two existing brick warehouses at 5 and 6 Necco Court, now dubbed “North Point”, by Consigli Construction is on schedule for delivery in the first half of 2019. Construction of the new 12-story office building, now dubbed “South Point”, by Suffolk Construction on a former section of the Procter & Gamble parking lot along Fort Point Channel is now scheduled for completion in mid-2021, along with new public open space along Fort Point Channel. 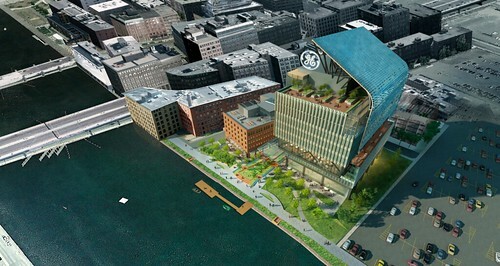 General Electric will now construct its’ Fort Point headquarters in two phases, pushing full completion of the project to 2021. Renovation of the two existing brick warehouses at 5 and 6 Necco Court, now dubbed “North Point”, by Consigli Construction is on schedule for delivery in the first half of 2019. Construction of the new 12-story office building, now dubbed “South Point”, by Suffolk Construction on a former section of the Procter & Gamble parking lot along Fort Point Channel is now scheduled for completion in mid-2021, along with new public open space along Fort Point Channel. The simultaneous renovation of the warehouse and construction of the office building was reportedly deemed too costly, which caused GE to take the cheaper two-phased approach instead. The decision follows John Flannery assuming the role of CEO at GE last week, and Flannery’s subsequent announcement that he would review all of GE’s operations in order to cut costs. “As with any construction project of this scope and complexity, we have been periodically reviewing the schedule and budget. Based on that review, we have decided that it makes more sense and is more cost-effective to construct the campus in two phases,” said Ann Klee, GE’s Vice President of Boston Development and Operations, in a prepared statement. The renovated warehouses will have capacity for approximately 300 employees; the new building will house an additional approximately 500 employees, for a total of approximately 800 employees across the headquarters at completion. 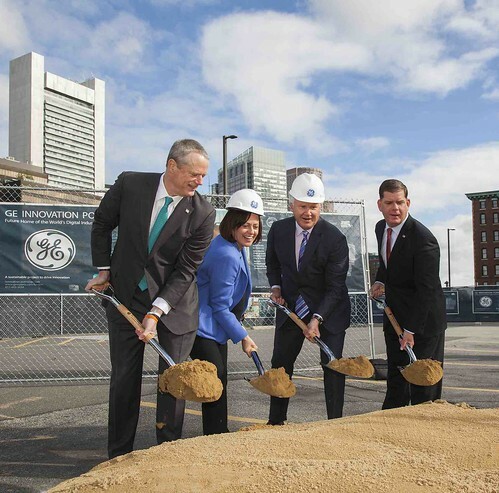 General Electric has broken ground on Innovation Point, its’ new $200 million, 390,000-square-foot headquarters campus located on the banks of Fort Point Channel in the heart of Boston’s Innovation District. A groundbreaking ceremony was held at Innovation Point on Monday (May 8th, 2017), with speakers including Jeff Immelt, GE’s Chairman and CEO, Ann Klee, GE’s Vice President of Environment, Health & Safety and Boston Development and Operations head, Massachusetts Governor Charlie Baker and Boston Mayor Martin J. Walsh. At Monday’s ceremony, GE announced that it will contribute $50 million towards Boston Public Schools, opioid addiction and other community causes. Mayor Walsh also announced that, over the next 25 years, GE will increase city taxes by $67 million. "This is a big day and a big statement, and one more step forward in the continuing evolution of Massachusetts as a global player on so many fronts and in so many ways," said Governor Baker. Approximately 800 GE employees are expected to work at Innovation Point, and construction of the campus will generate approximately 1,500 jobs. State and city government officials offered GE $145 million in incentives to relocate its’ headquarters to Boston. Boston’s “great innovation ecosystem, huge talent pool, great leadership and wonderful quality of life” made the city an “obvious choice” for GE, said Klee. “What we're bringing here together is one of the country's oldest companies, in GE, has moved its headquarters to one of the country's oldest cities, in Boston, for the purpose of creating the future,” said Immelt. Pictures from GE’s groundbreaking ceremony are posted below, and newly revealed renderings of Innovation Point are posted above. General Electric and MassDevelopment closed Friday (December 16th) for $83 million on the acquisition of the 2.5-acre future site of General Electric’s $200 million headquarters in Fort Point. The site was sold in two separate transactions. MassDevelopment paid $57.4 million to acquire the historic warehouses at 5 and 6 Necco Court, which will be renovated and incorporated into the future headquarters facility. MassDevelopment's acquisition is part of the State of Massachusetts' $120 million incentive that is being used to build General Electric's headquarters. MassDevelopment also closed Friday on $90 million of financing through Citizens Bank, which will be used to acquire and renovate the Necco Court warehouses. General Electric paid $25.6 million to acquire the remaining land on which a new 12-story, 293,000 square foot building will be constructed. General Electric’s new facility will total 390,000 square feet. It was also announced Friday that Suffolk Construction will be the facility’s construction manager. 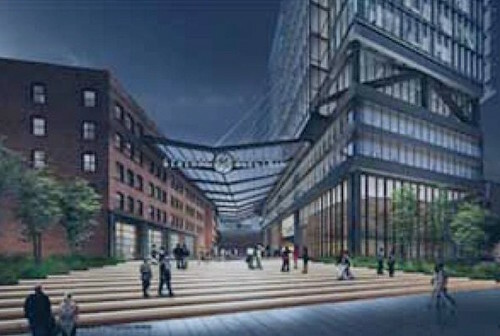 At last night's board meeting, the Boston Planning & Development Agency (BPDA) approved the $200 million General Electric (GE) Headquarters project in Fort Point. Pending zoning and environmental approvals, GE's new headquarters is expected to break ground in Early 2017 and open at least partially in 2018, The Boston Globe reports. The Boston Globe reports that General Electric (GE)’s acquisition of its’ future Fort Point headquarters site is moving forward. On Thursday, the board of MassDevelopment, the state economic development and finance agency, reportedly authorized the purchase of the two historic warehouse buildings at 5 and 6 Necco Court, which will be incorporated into GE’s headquarters facility, and an acre of land that will be used for open space. The MassDevelopment board also authorized MassDevelopment on Thursday to apply for up to $120 million in state grants that would be used for the purchase and improvement of GE’s headquarters site. MassDevelopment Chief Executive Marty Jones states that GE aims to start construction work at the the historic buildings as soon as this fall, with completion and occupancy of the entire facility expected in 2018. GE executives will move this summer to 33-41 Farnsworth Street in Fort Point, which will serve as GE’s temporary headquarters. GE’s acquisition of the headquarters site is expected to close in September. The approximately 2.5 acre site will reportedly be subdivided into an acre of open space, approximately half an acre where the historic buildings stand and approximately one acre where GE’s new 293,000 square foot building will be erected. MassDevelopment will reportedly own the open space and historic buildings parcels, and GE will own the new building parcel. GE will lease the historic buildings from MassDevelopment. More information about the General Electric Headquarters project is posted below. General Electric has filed a Letter of Intent to construct its new headquarters facility fronting Fort Point Channel in Boston. As previously reported, the existing warehouse buildings at 5 and 6 Necco Court will be rehabilitated. The buildings will be connected by a new shared lobby and atrium. A new 293,000 square foot, 12-story building will be built next to the existing buildings. 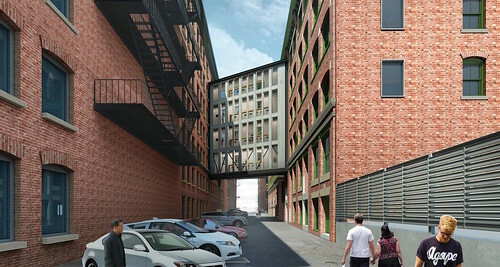 The new building will be connected to the buildings by a pedestrian bridge as well as a new pedestrian passageway, GE Plaza, that will connect Necco Street and the Fort Point Channel harborwalk. Part of GE Plaza will be located underneath a transparent canopy. General Electric's new facility will include approximately 42,430 square feet of new public waterfront open space along Fort Point Channel. Improvements will also be made to the existing Harborwalk. The following is a link to the Letter of Intent for the General Electric Headquarters. More information about the General Electric Headquarters is posted below. The Boston Globe reports that General Electric has reached a deal to buy a 2.5-acre parcel on Fort Point Channel. The parcel consists of two vacant warehouses and parking. General Electric will build a new headquarters facility on the parcel. Procter & Gamble, current owner of the parcel, will retain much of the current parking lot; only a section of the lot will be sold. General Electric will develop the new facility in partnership with the Boston Redevelopment Authority. The Boston Redevelopment Authority will own the facility, and General Electric will lease. Sale of the 2.5-acre parcel is expected to close in nine to 12 months; General Electric hopes to occupy the new facility by 2018. General Electric has not yet filed development plans; an architect for the new facility is yet to be hired. Approximately 800 people will work at General Electric's new facility.